During the American War of Independence (1775-1783), the Landgraviate of Hesse-Kassel, the Principality of Wolfenbüttel, the Electorate of Hanover, Saxony-Anhalt, and other regions in present-day German rented soldiers to the British on subsidiary contracts. 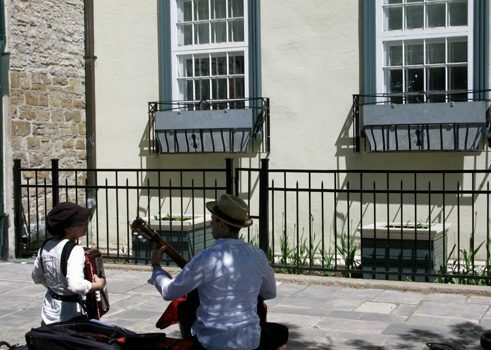 Musicians in Quebec City | © Goethe-Institut Montreal Up to 30,000 German mercenaries under British command fought against the American revolutionary troops. As a result, the British colonial power could avoid having English soldiers fight their former compatriots. Many of these German mercenaries were stationed in Quebec and ended up spending seven years there. Out of the approximately 10,000 mercenaries stationed in Canada, around 1,300 stayed in the province of Quebec after the war. This influx of qualified workers had a positive effect on Canada at the time, both economically and socially. The local population had relatively little education, particularly in the francophone territories, as many merchants and intellectuals left the country following the defeat of the French in 1760. Among the German mercenaries who settled in Quebec were craftspeople, merchants, doctors, and musicians, who all had an influence on life in their new country. On of the former mercenaries who stayed in Quebec was Frederick Glackmeyer, who was born in Hanover in 1759. He married Marie-Anne O’Neil in Quebec City on September 25th, 1784. They had 16 children, and he died in Quebec on January 13th, 1836. Not much is known about his life before his marriage in Quebec. In 1777, he was hired as the music director of a German military contingent under the command of Lieutenant Colonel Johann Gustav von Ehrenkrok. It is unclear when exactly he arrived in Quebec. Upon his release from his military contract in 1783, General Major Friedrich Adolph Riedesel offered him a position as a pianist in his native Germany, but Glackmeyer decided to stay in Quebec. piano, guitar, violin, and flute; by 1825, he had added viola and cello to his repertoire. In addition, he sold copies of music scores, and he started offering repair and tuning services for a range of musical instruments in 1785. He advertised in the local newspapers, such as the Gazette de Québec, Québec Mercury, and Québec Herald. Glackmeyer also used his talents as a singer and musician to actively participate in musical events, like concerts and dances. He even composed pieces for festive occasions and to honour dignitaries and notable personalities. 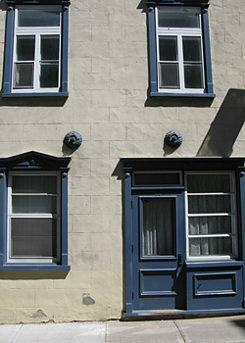 Glackmeyer is mentioned as the first music teacher in Quebec in the writings of the nuns of the Ursuline order. However, the fact that the family often moved house suggests that Glackmeyer faced financial problems in spite of his numerous engagements and activities as a musician, teacher, and merchant. He also suffered from domestic troubles and poor health from 1822. To make matters worse, the Quebec Harmonic Society (Société harmonique de Québec in French) ceased their activities around the same time. Glackmeyer himself had founded the Quebec Harmonic Society, an ensemble where professional musicians and amateurs played side-by-side, and became its vice president in November 1820. Fortunately, the Harmonic Society later became active once more, and its orchestra and concerts were significantly involved in the cultural life of Quebec, just like in its early years.